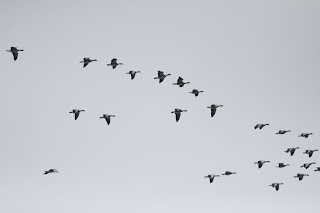 The increasing NW wind brought the expected influx of geese, although getting accurate counts as flocks come in, headed out to sea, turned round again, split up and circled the island was not easy. However, the 8th saw at least 870 Greylag, 194 Pink-feet and 6 Barnacles, whilst 480 Greylag and 20 Barnacles passed through on 9th. Honk. 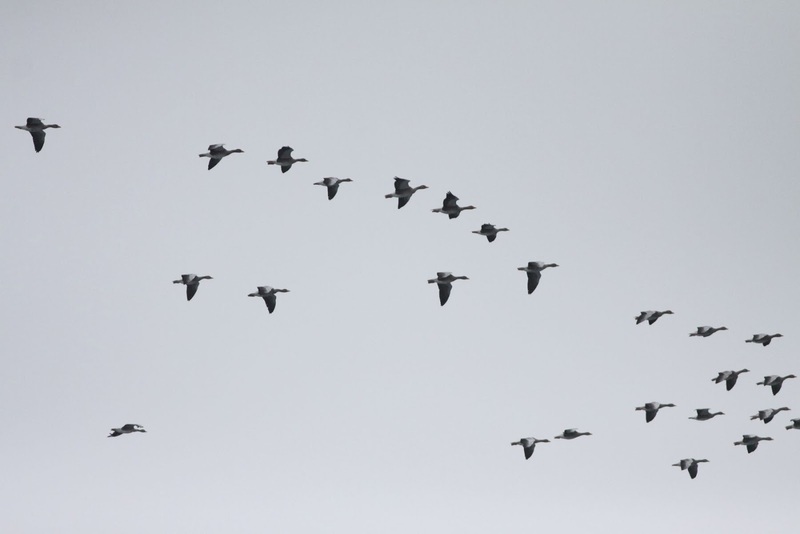 Another skein of Greylags pass over. The winds increased to gale force northerlies on the afternoon of 9th, but before they did, a few good birds were found. A Buff-breasted Sandpiper seen briefly on the west cliffs near North Naaversgill was probably the highlight (with presumably the same bird having been seen distantly in flight near Busta the day before) and also new for the year list was a Short-toed Lark at North Haven. The latter continues the fine run of annual occurrences for this scarcity on Fair Isle, with the last blank year way back in 1962. 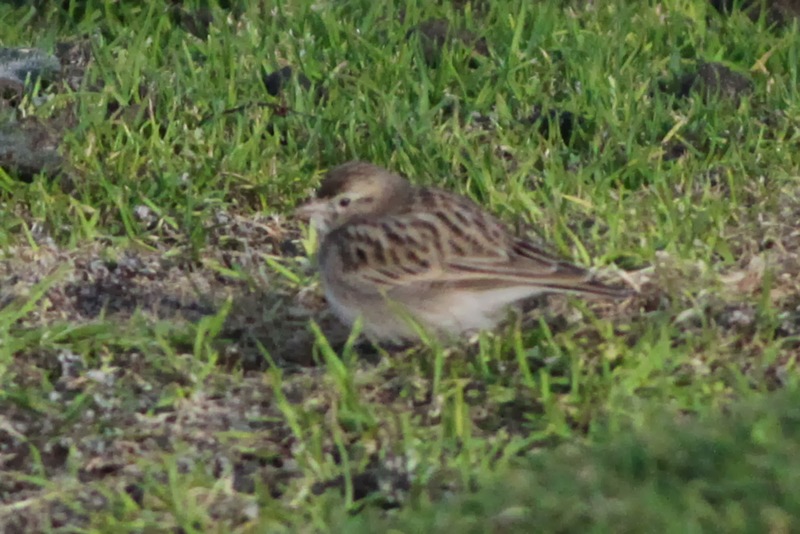 With a light southerly passage of Skylarks, Meadow Pipits and Starlings noted during the morning, it’s interesting to speculate whether the Short-toed Lark may have been the recent bird from Sumburgh caught up in the movement. The Short-toed Lark showed well in the Havens at times, although staying steady enough to get a decent photo in the increasing winds proved tricky. A Little Bunting at Chalet was also new in and, combined with the lingering Great Grey Shrike (which has become a bit more cooperative now that it has moved to Bull’s Park, where it was seen eating a Twite), a Richard’s Pipit near the Chapel (which may be the lingering bird reappearing), the Dotterel at Barkland and a single remaining Yellow-browed Warbler (following 6 still present on 8th), it was a good haul of birds all in all. The tally of good recent records (certainly better than the weather forecast may have suggested we were going to get) was added to by a brief Olive-backed Pipit at Hesswalls on 8th. Other signs of new birds in on 9th included the first Goldfinch of the autumn, the first 2 Fieldfare for a few days, 2 Lapland Buntings and an increase of Redwings (with a total of 53 including a flock of 31 in the Obs garden), whilst the Hen Harrier and a single Great Spotted Woodpecker both also remain. Time for a cheeky catch up. You wind some, you lose some.